Director/Story – Brad Bird, Screenplay – Ted McCanlies, Based on the Novel & Play The Iron Man by Ted Hughes, Producers – Allison Abbate & Des McAnuff, Music – Michael Kamen, Production Design – Mark Whiting. Production Company – Warner Bros. Feature Animation. Rockwell, Maine, 1957. Young Hogarth Hughes discovers a giant metal-eating robot that has crashed in the woods near his home. He cautiously befriends it, hiding it at the scrapyard of a beatnik friend. As Hogarth tries to keep the iron giant’s existence a secret from his mother and the locals, an obsessed government agent comes, determined to find the robot. In 1985, director Brad Bird made the Family Dog episode of Steven Spielberg’s anthology tv series Amazing Stories (1985-7), the single bright spot in an otherwise insipid series. Family Dog offered a delightfully wry depiction of family life as seen through the eyes of a dog. Brad Bird continued work for Spielberg, turning in the script for Batteries Not Included (1987) and then helping spin Family Dog out as a short-lived (10 episode) cartoon series in 1993, something that never lived up to the potential of the original episode. Bird then went on to work as a director, producer and the nebulously termed ‘executive consultant’ on various animated series such as The Simpsons (1989– ), The Critic (1994-5) and King of the Hill (1997-2010) and it increasingly seemed that his name would vanish into anonymity and the joys of the original Family Dog would be all but forgotten. Thankfully, Brad Bird obtained a second chance with The Iron Giant – an opportunity he fulfils superbly. (The great disappointment about The Iron Giant is that it vanished almost unnoticed amid an over-packed 1999 summer release schedule, despite universally glowing reviews). Which is an enormous shame as The Iron Giant is a lovingly crafted film and one of the best children’s films made in ages. The friendship between the boy and the robot is beautifully conducted – the giant’s expressive range comes with a lugubrious gaucheness that makes it instantly endearing. The sacrificial ending when it comes is something as heart wrenching as anything in E.T. – The Extra-Terrestrial (1982). The animation in The Iron Giant is easily as good as anything in Disney films of the 1990s but, unlike most of these, Brad Bird emphasizes story and feeling and in a far more unassuming way leaves most of Disney’s self-conscious artistic flourishes for dead. The Iron Giant is also a lovingly constructed homage to the 1950s and filled with touches that many of the children in the audience would not pick up on – such as authentic replications of Action Comics, Forbidden Planet (1956) posters and Duck and Cover films. 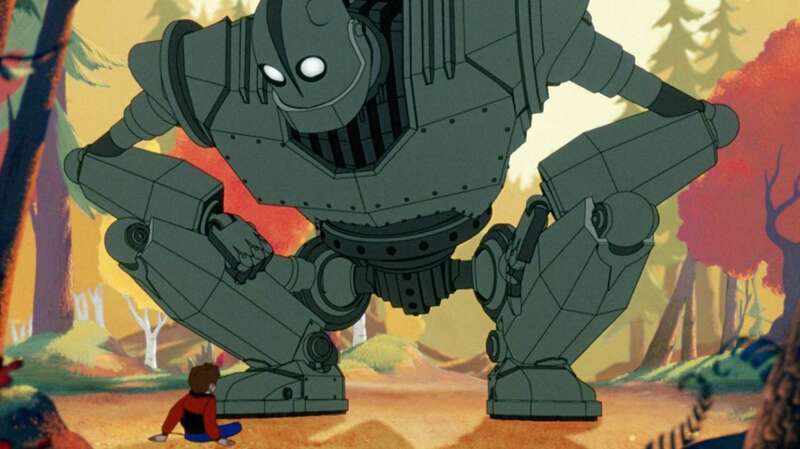 Indeed, The Iron Giant becomes the antithesis of 1950s science-fiction films like Kronos (1957) and The Colossus of New York (1958) where at the end what would normally be regarded as a triumph with the military vanquishing the alien menace is turned around to make a potent message about xenophobia, mindless militarism and the devastating effect of nuclear weaponry. The Iron Giant later made a key appearance in Steven Spielberg’s Ready Player One (2018). Brad Bird would later go on to join forces with Pixar for the witty superhero spoof The Incredibles (2004) and then Ratatouille (2007) about a talking rat chef, which both proved much more successful than The Iron Giant. He subsequently moved into live-action to direct Mission: Impossible – Ghost Protocol (2011) and Tomorrowland (2015) before returning to Pixar for Incredibles 2 (2018). (Winner in this site’s Top 10 Films of 1999 list. Nominee for Best Adapted Screenplay at this site’s Best of 1999 Awards).